All this is very poetic, if evolutionarily unlikely. And the “state of nature” in Genesis is simply unhistorical. Nonetheless, one can appreciate the attractiveness of the Isaiah vision to Quaker Hicks. In the U.S. we grown enough corn and soybeans as animal feed to feed approx 8 billion people (calorically, not necessarily in a nutritionally complete way). Factory farms produce outrageous amounts of pollution and add to our growing problem of antibiotic resistant bacteria. We have so greatly overfished the oceans that some species populations are so low and immature that they become extinct - endangering the precarious balance of the seas. While the arguments from the quoted scriptures are about the morality of killing animals for pleasure (in today's modern first world animals are not needed for sustenance) but large-scale meat eating is a serious problem for people too. The Bible is pretty clear when it comes to treating people well, making sure that everyone has sufficient food, clean air and water, effective drugs, and an overall healthy environment. 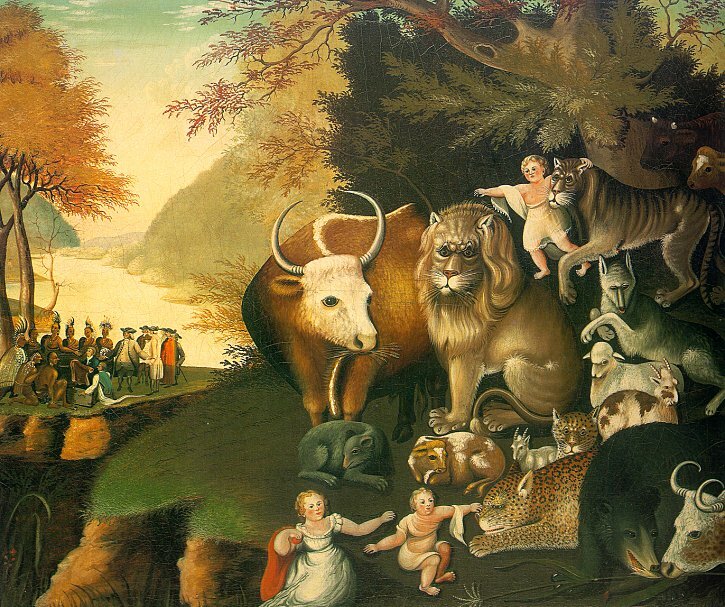 The Peaceable Kingdom, by Randall Thompson, will be sung at the Four Choirs (Calvary, East Liberty Pre, Shadyside Pres, St Andrew's) on Sunday, May 5 at 4:30 at East Liberty Pres.